Using candlesticks in conjunction with each other can indicate the market sentiment by highlighting a shift in power between the buyers and the sellers. 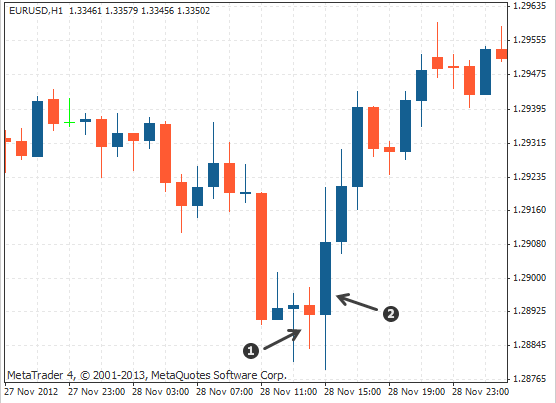 Candlestick patterns can therefore provide signals, such as a reversal or a continuation of price action. The engulfing pattern is a strong reversal signal that can be bullish or bearish and is composed of two candlesticks – the body of the second candlestick must engulf the body of the preceding body. There has to be a confirmed uptrend or downtrend, even if it is short-term. The market must not be ranging (going sideways). The body of the first candlestick must be smaller than the second one. The second body must engulf the preceding body. It is not necessary for the second body to engulf the actual wick of the first candlestick, although this does create an even stronger signal. The second candlestick body must be opposite to the first candlestick body, i.e. if the first candlestick is bullish, the second candlestick must be bearish. Note that the strongest engulfing pattern is one where the whole candle engulfs the prior day's range from high to low, not just the body, generating a strong signal of the imminent market reversal. The following example shows a bullish engulfing pattern signalling the reversal of a downward trend and demonstrating how the sellers were overpowered by the buyers. 1 The first candlestick is bearish. 2 The second candlestick is bullish and engulfing the body of the preceding bearish candlestick. The following example shows a bearish engulfing pattern signalling the reversal of an uptrend and demonstrating how the buyers were overpowered by the sellers. 1 The first candlestick is bullish. 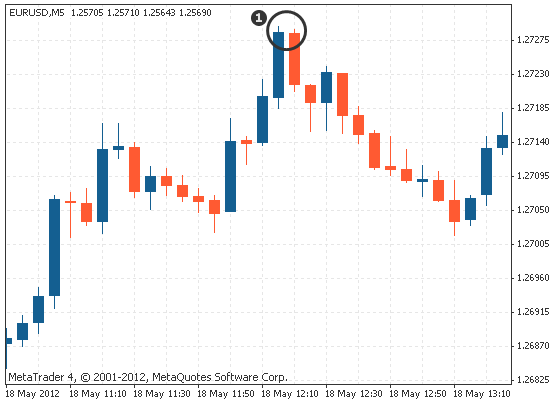 2 The second candlestick is bearish and engulfing the body of the preceding bullish candlestick. Tweezers are formed by two candlesticks that have matching highs or lows. As the two wicks have the same height, it appears as a pair of tweezers; a discrepancy of a few pips is acceptable. The market should be in a confirmed uptrend or downtrend for the signal to be a valid reversal. Tweezers are formed by two candlesticks that have matching highs or lows. 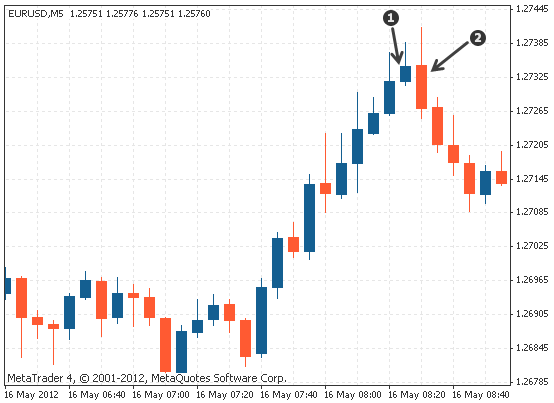 In the example provided below, there are two candlesticks at the end of an uptrend. 1 The first candle is bullish and the second candle is bearish. The wicks are of equal length and the highs are at the same level. The wick of the first candlestick shows that the buyers have been overpowered by the sellers. The second wick represents a second attempt by the buyers to continue pushing the price up and then being overcome again by the sellers. After two unsuccessful attempts by the buyers to continue the trend upwards, the buying pressure eases off and the bears successfully push the price back to the downside. The following example shows a tweezers bottom pattern after a downtrend. 1 The lower wicks are of equal length and the lows are at the same price level. The wick of the first candlestick shows that the sellers have been overpowered by the buyers. The second wick represents a second attempt by the sellers to continue pushing the price back down and then being overpowered by the buyers. After two unsuccessful attempts by the sellers to continue the trend down, the selling pressure eases off and is eventually overpowered by the bulls. The bodies or wicks do not have to be exactly the same size or even in consecutive order. The important aspect when looking for a tweezers pattern is two wicks with equal highs. This indicates that either the buyers or the sellers were eventually overpowered, indicating a reversal. The term "reversal signal" can be slightly misleading when used with candlestick patterns. A long-term trend (i.e. hourly time frames or above) could take some time to change after you see a pattern form. The reversal could happen in stages and not immediately after the formation of a candlestick pattern. engulfing candlestick patterns indicate a reversal, but not necessarily an immediate or significant reversal. in a bullish engulfing pattern, the first candlestick is bearish and the second is bullish and the body of the bullish candlestick must engulf the preceding bearish candlestick. in a bearish engulfing pattern, the first candlestick is bullish and the second one is bearish and the body of the bearish candlestick must engulf the preceding bullish candlestick. a tweezers top and bottom signal a reversal pattern. for a tweezers top and bottom, one candle is bullish and the second candle is bearish and the wicks should be of equal length.